After a redesign in 2011, the 2012 Volkswagen Touareg receives few changes. The Touareg is not your average Volkswagen. It is a decidedly upscale SUV taking on luxury five-seat crossovers such as the BMW X5, Mercedes-Benz ML350, Lexus RX 350, and Cadillac SRX. The model comes standard with all-wheel drive, rain-sensing windshield wipers, Bi-Xenon high-intensity headlights, 18” alloy wheels, a modern 8-speed automatic transmission with shifter. Volkswagen also offers buyers 3-year/36,000 miles no charge-scheduled maintenance. The Touareg has been lauded for its high-quality, luxurious interior, plush ride, and great towing capacity at up to 7,700 pounds. And it should be lauded considering the 2012 Touareg V6 Sport starts at an MSRP of $42,975. The Touareg is offered in four trim lines: V6 Sport, V6 Sport with Navigation, V6 Lux, and V6 Executive. Each trim line offers two different engines: a 3.6-liter 280 horsepower V6 and a 3.0-liter 225 horsepower V6 turbo diesel. The fuel economy of these engines is 16-mpg city and 23-mpg highway and 19-mpg city and 28-mpg, respectively. The 2012 Touareg V6 Executive has an MSRP of a whopping $54,255 with standard leather seats, heated rear seats, 10-speakers, power tinted panoramic sunroof, and 20” wheels. The diesel in this trim costs $57,755. A sporty Touareg R-line may be available later in calendar year 2012. It is currently sold in Europe. 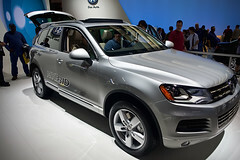 VW also offers the Touareg Supercharged Hybrid, a model that blends performance and fuel-efficiency. The 2011 model, which had an MSRP of $60,565, was rated at 20-mpg city and 24-mpg highway with a 3.6-liter 380 horsepower V6 engine. This same engine is found in the Porsche Cayenne Hybrid, but that model costs about $7,000 more. In addition to its high price, the Touareg’s negatives may include only middling fuel economy with the gas V6, average cargo volume for a mid-size SUV, and no third-row of seats. The Touareg is a safe and secure SUV. It offers standard engine braking assist, hill descent assist, and anti-intrusion side door beams. The Touareg was on the IIHS’ list of safest 2011 SUVs. The model also has a standard anti-theft alarm with warning LED, and an immobilizer theft-deterrent system. These systems really cut down on vehicle theft. The Touareg first debuted in 2004 and it has crept up in features and price since that time. Volkswagen added a second crossover to its lineup in 2009 with the Tiguan. However, the 2012 Tiguan starts at a price of $22,820, a more than $20,000 price disparity. A top of the line Tiguan can surpass $35,000 with added options. It is surprising that VW has not slotted the Touareg in the $30,000-$40,000 price range or built it on a larger frame to accommodate a third-row of seats. The Touareg is built off a platform similar to the three-row Audi Q7. The excellent Porsche Cayenne also shares its platform.